In an unmistakable sign of desperation, the newspaper industry has made a Faustian pact with the Devil. Struggling to make money in an Internet era when readers crave more news but stubbornly refuse to pay for it, major news organizations including The New York Times and Washington Post are floundering with declining subscribers to the print edition and revenues and profits in free fall. In the present era, content is valuable only as long as it’s free. Now under a cockamamie scheme that Facebook has cooked up called Instant Articles, a bunch of newspapers have agreed to publish some of their news stories on the social networking site. Newspapers will get all the revenue from ads in the news pieces if they sell it themselves or 70% if Facebook sells it. Publishers that have jumped into Facebook’s bed include The New York Times, National Geographic, BuzzFeed, NBC, The Guardian, BBC News, Spiegel and Bild and The Atlantic. I believe this partnership can only enhance the value of Facebook to its users, further diminish the branding of newspapers, reduce page views of publishers’ web sites and decrease the ability of newspapers to sell ads on their web sites. 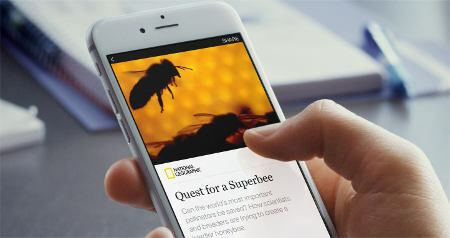 Instant Articles is supposed to include interactive features for users like zoom in, ability to explore high-resolution photos by tilting the smartphone, watch auto-play videos come alive while scrolling through stories, explore interactive maps, listen to audio captions and like and comment on individual parts of an article in-line. There are no easy solutions to the woes of the publishing industry but asinine partnerships like the deal with Facebook are no solution and will only worsen their financial plight.